Henry Casey Camp No. 92 Sons of Union Veterans of the Civil War has elected and installed officers for the year 2017. Pictured left to right (front row) Terry Thevenin, senior vice commander; Terry Cochren, camp commander; Joe Daugherty, junior vice commander; back row (left to right) Shawn A. Cox, historian; Shane Milburn, chaplain; and Robert E. Grim, camp treasurer. Henry Casey Camp 92 Sons of Union Veterans of the Civil War (SUVCW) recently elected and installed their officers for 2017. The local camp is named in honor of Henry Casey from Bloomingburg, who is one of only four Fayette County residents to be awarded the Congressional Medal of Honor All four received the Medal of Honor for action during the Civil War. The SUVCW was established by the Grand Army of the Republic (GAR) in 1881, and received a congressional charter following the death of the last GAR member in 1956. Membership is restricted to descendants of Union Civil War veterans and is dedicated to promoting patriotism and preserving the heritage of the Grand Army of the Republic (G.A.R.) and the men who served in the Union military forces during the Civil War. 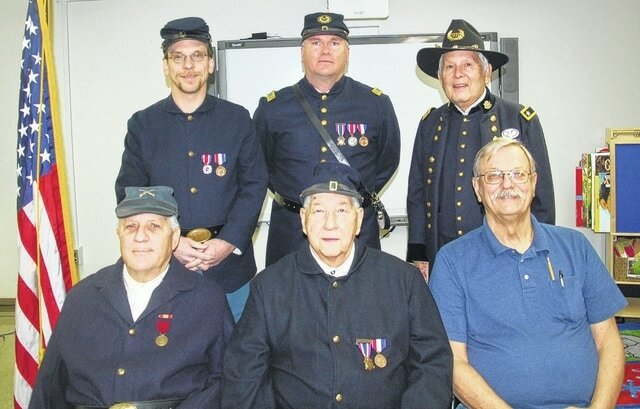 Several of the Henry Casey Camp members also belong to the Sons of Veterans Reserve (SVR), which is the uniformed division of the SUVCW that participates in ceremonies dressed in Civil War uniforms. The local SVR unit is Company C, 20th Ohio Volunteer Infantry commanded by 1st Lt. Shane Milburn. That is the Union Army unit that Cpl. Henry Casey served in during the Civil War. The national commanding general of the SVR is Robert E. Grim, who is also a member of the local unit. https://www.recordherald.com/wp-content/uploads/sites/27/2017/02/web1_officer-installation-photo-2017.jpgHenry Casey Camp No. 92 Sons of Union Veterans of the Civil War has elected and installed officers for the year 2017. Pictured left to right (front row) Terry Thevenin, senior vice commander; Terry Cochren, camp commander; Joe Daugherty, junior vice commander; back row (left to right) Shawn A. Cox, historian; Shane Milburn, chaplain; and Robert E. Grim, camp treasurer.